One lucky player turned R500 into R90,000 over a weekend at South Africa's Thunderbolt Casino. Terry V's first big win was an R8344 spin on RTG's Lucky 6 slot and then things started to get crazy. After an R11,015 win, Terry lost a few thousand on the next few spins. She had R14,009 in her account when she won over R56,000 thanks to grouped Wilds and a 5X multiplier. "To be honest I was about ready to call it a day when I lost on three spins in a row," said the winner. "But the thing is, you just never know what you're going to get on that next spin, do you?!" "My first reaction was – can this be real?! This is the first time I’ve ever been so lucky!" 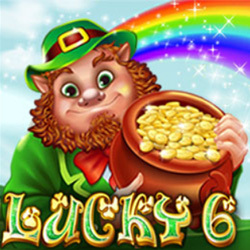 she told a Thunderbolt Casino customer service rep.
Lucky 6 is a 6-reel leprechaun-themed game from RTG where Scatter symbols give extra wilds and grouped wilds and multiply prizes. Rainbows are grouped Wilds and double the payout when part of a winning combination. Four or more Scatter symbols (L, U, C, K, Y AND 6) can trigger up to 25 free spins. If you get them in order and on one line, they can add extra grouped wilds, turn Pot of Gold symbols wild, and multiply prizes up to 5X. Thunderbolt Casino has hundreds of games from Realtime Gaming, all played in Rands, in its online casino for desktop and laptop computers and in the mobile casino for smartphones and tablets. Since the beginning of the year, South Africa's Thunderbolt Casino has introduced six new Chinese-themed slot games. Last week they launched Tian Di Yuan Su (Gods of Nature). Until July 6, the popular South African online casino is giving active players 30 free spins on the exotic new game.